Discover the beauty of Japan's architecture and gastronomic excellence. Enjoy the neighbourhoods of Asakusa, Shibuya and Shinjuku in Tokyo. Fall in love with the traditions of Kyoto and get lost in modern Osaka, all the while travelling by train with an included Japan Rail Pass. Head to enigmatic South Korea and it's capital, Seoul for a taste of its unique pop-culture and Buddhist traditions. International flights: UK - Tokyo, Seoul - UK. 7 day Japan Rail Pass. 4 Breakfast & 6 Lunches. Transfer in an air conditioned vehicle. Tokio: Vessel Inn Ueno Iriya Ekimae or Comfort Hotel Tokyo Kiyosumi Shirakawa. *** Possibility of booking optional excursions in the next step of the booking. Please note that all additional optional excursions which are not selected at time of booking must be requested before final payment is made at least 45 days before departure. The final price will be shown once you have selected the optional excursions, in the final step of the reservation process. Drinks, tips * and any other services not mentioned in what's included. * Tip shall be collected along with tour fee and wire-transferred prior to the tour. Tip for local Guide: £4/pax/day. Arrival at UK departure airport ready to check-in for a flight to Tokyo. Night on board. Arrive in the capital of Japan, the vibrant city of Tokyo. Transfer to the hotel. Tokyo is a dazzling metropolis rich in history and tradition. Rest of the day free to start discovering this exciting city of contrasts and its delicious cuisine. Overnight stay in Tokyo. 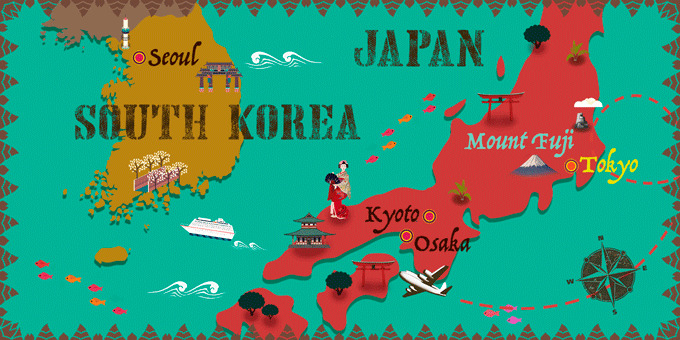 Today come face-to-face with the emblem of Japan on a full-day tour to Mount Fuji and Hakone. The bus heads up to the 5th Station along the Subaru Line, at 2,300 metres above sea level. At this height, you will be amazed by the breathtaking views from above the clouds. After lunch, visit Ashi Crater Lake and admire the superb view of Mt. Fuji whilst sailing on the lake. Take the short journey to the peak of Mt. Komagatake and then a cable car ride up to the spiritual Hakone Shrine, Mototsumiya, that nestles at the top of the mountain. Return to the city and overnight stay in Tokyo. Using your Japan Rail Pass, travel to Kyoto, the capital of the Japanese Empire for 11 centuries. We recommend visiting Mount Hiei and its main temple in the Buddhist school Tendaishū or explore Pontocho, an emblematic neighbourhood known for its traditional architecture and geishas. Overnight stay in Kyoto. Today, embark on a half-day guided tour of Kyoto and discover some of Japan's most important historical and cultural centres including Nijo Castle, listed as a UNESCO World Heritage Site. The historical castle was completed in 1626 and was built to provide lodging for Tokugawa Shogun. It was also used as palladium for Kyoto Imperial Palace. Visit Kinkaku-Ji Temple, a World Heritage Site also known as the Golden Pavilion. The wooden architecture is covered in thin layers of pure gold and it is surrounded by a beautiful lake. Enjoy the beauty of the Fushimi Inari Taisha Shrine and discover Kyoto's Imperial Palace and its spectacular garden. Lunch included. Enjoy a visit to Kitano Tenmangu Shrine main hall which is a designated national treasure and famous for housing the God of Scholarship. This shrine is beautiful to visit during the spring plum blossom and autumn leaf seasons. Rest of the day at your leisure. Overnight stay in Kyoto. Spend the morning at your leisure and transfer to Osaka, using your Japan Rail Pass. We recommend an afternoon walking tour of the city to get to know the city better. * Overnight stay in Osaka. Transfer to the airport for a flight to Seoul, South Korea. Arrive in Seoul, a huge metropolis and capital of South Korea, home to towering skyscrapers and vibrant pop culture. Transfer to the hotel, lunch and spend the rest of the day exploring the city, sampling the local cuisine and soaking up the exuberant atmosphere. Overnight stay in Seoul. Breakfast at the hotel. Today, set off on a fascinating tour of Jeonju, known for the Jeonju Hanok Heritage Village, an area of traditional houses, craft shops and food stalls. Admire the unique architecture of the traditional houses and wander around the museums and stalls, showcasing valuable parts of both South Korean and Japanese culture. Lunch and further explore the city, which is home to a number of centuries-old hilltop pavilions, providing sweeping views across the surrounding area. Return to Seoul and the rest of the day is at your leisure. Overnight stay in Seoul. Today, see a different side of Seoul with an excursion to Nami Island & Petite France with breakfast and lunch included. Nami Island is sure to captivate you with its idyllic setting. This half-moon shaped island, formed by the rising water of the North Han River, is a natural haven and the perfect place for a relaxing stroll amongst unspoilt nature, without traffic or busy crowds. The island is also home to free-roaming bunnies and other adorable wildlife. After enjoying Nami Island, head to Petit France, a French-themed attraction centre and a celebration of French culture, complete with an Eiffel Tower model and traditional chateaux-style buildings. After the visit, return to the city and overnight stay in Seoul. Breakfast at the hotel. Set off for a full day discovering the beautiful architecture and landscape of Seoul while learning about its history, culture and traditions. Visit two grand palaces, including UNESCO World Heritage-listed Changdeokgung Palace; learn about traditional lifestyles at a museum; and explore bustling local markets by foot. Marvel at the pavilions and gardens of UNESCO World Heritage-listed Changdeokgung Palace, Gyeongbokgung Palace and Jogyesa Buddhist Temple before you enjoy an authentic Korean lunch at a local restaurant. Spend the rest of the evening at your leisure. Overnight stay in Seoul.